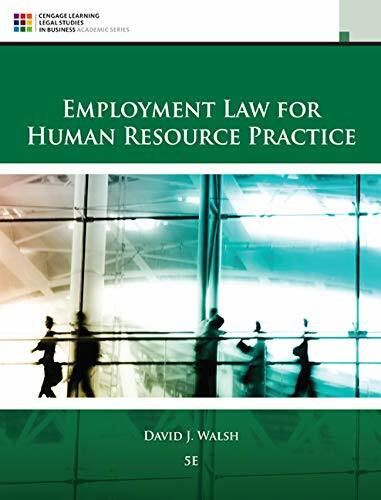 Packed with cutting-edge cases and hands-on applications, EMPLOYMENT LAW FOR HUMAN RESOURCE PRACTICE, 5TH EDITION explains the major issues and rules of employment law and how they apply to your human resource career. The text addresses human resource practices associated with each stage of the employment process--from hiring, to managing, to firing. Clippings of current news stories, hypothetical situations, and real cases help you understand how legal concepts apply to business situations, while practical advice for what to do as a manager is summarized at the end of each chapter. Covering the most important employment law topics, the text is completely up to date with the latest legislation, new regulations, and recent case law. It includes extended coverage of the rights of vulnerable employees under the Americans with Disabilities Act, racial discrimination, the use of background checks, the Family Medical Leave Act, and more.